Restoring the Union following the destruction of the Civil War proved to be an enormous task. Several questions emerged in the wake of General Robert E. Lee’s surrender at Appomattox Courthouse in April 1865; namely, the pace and scope of reintegrating former rebels and Confederate states back into the Union, rebuilding the southern economy, and the future of millions of newly freed slaves. President Abraham Lincoln’s desire to enact swift Reconstruction clashed with the so-called Radical Republicans in Congress who wanted to punish the South. President Andrew Johnson, who took office after Lincoln’s assassination on April 14, 1865, tried to follow Lincoln’s general approach to Reconstruction and was eventually impeached for it. 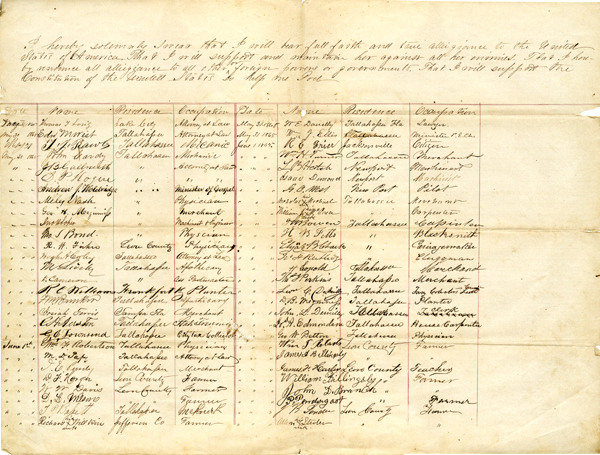 The latest additions to the significant documents page on Florida Memory are artifacts from the early period of what historians call Presidential Reconstruction. Part of the plan implemented by Johnson included granting amnesty to some former Confederates who pledged an oath of loyalty to the United States.